We'll help you get started with your NOOK® for Windows 8™ app in a few easy steps. From the start screen on your Windows 8 device open the Store. Swipe right to left on the screen to bring up the charms sidebar. Use the search function to locate the "NOOK" App. Tap the white 'n' NOOK icon to open the app details page. Tap "Install" to download and install the App on your Windows 8 device. If you have an existing Microsoft account, click or tap on the "Continue with your Microsoft account" button and follow the on screen instructions to sign in. If you do not already have a Microsoft account, please click the "Sign up for a Microsoft account" link and follow the on-screen instructions to create one. If you have an existing NOOK or Barnes & Noble account, follow the on-screen instructions to use it to sign in on NOOK for Windows 8. If you do not already have a NOOK account, please click or tap on "Create a NOOK account" and follow the on-screen instructions. By creating a NOOK account, you can access your NOOK Library across other NOOK devices and NOOK Reading Apps. That's it! 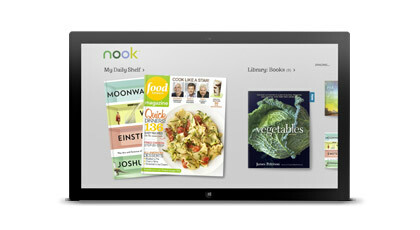 Have fun enjoying NOOK® for Windows 8™.